Even after the ruinous financial crisis of 2008, America is still beset by the depredations of an oligarchy that is now bigger, more profitable, and more resistant to regulation than ever. Anchored by six megabanks Bank of America, JPMorgan Chase, Citigroup, Wells Fargo, Goldman Sachs, and Morgan Stanley which together control assets amounting, astonishingly, to more than 60 percent of the country's gross domestic product, these financial institutions (now more emphatically too big to fail ) continue to hold the global economy hostage, threatening yet another financial meltdown with their excessive risk-taking and toxic business as usual practices. How did this come to be and what is to be done? These are the central concerns of 13 Bankers, a brilliant, historically informed account of our troubled political economy. 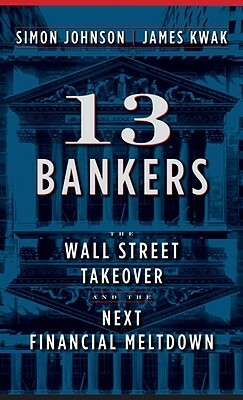 In 13 Bankers, Simon Johnson one of the most prominent and frequently cited economists in America (former chief economist of the International Monetary Fund, Professor of Entrepreneurship at MIT, and author of the controversial The Quiet Coup in The Atlantic) and James Kwak give a wide-ranging, meticulous, and bracing account of recent U.S. financial history within the context of previous showdowns between American democracy and Big Finance: from Thomas Jefferson to Andrew Jackson, from Theodore Roosevelt to Franklin Delano Roosevelt. They convincingly show why our future is imperiled by the ideology of finance (finance is good, unregulated finance is better, unfettered finance run amok is best) and by Wall Street's political control of government policy pertaining to it. Simon Johnson is Ronald A. Kurtz Professor of Entrepreneurship at MIT s Sloan School of Management and a senior fellow of the Peterson Institute for International Economics. He is coauthor, with James Kwak, of The Baseline Scenario, a leading economic blog, described by Paul Krugman as a must-read and by Bill Moyers as one of the most informative news sites in the blogosphere. James Kwak has had a successful business career as a consultant for McKinsey & Company and as a software entrepreneur." "How Modern Wall Street—the most powerful and concentrated financial sector in the country’s history—both created the financial crisis and ensured a bail-out for its own benefit." "Mr. Johnson offers an enticing vision of a Wall Street confined, its potency limited to put-downs and head-shaking: a Wall Street where right-sized banking is a do-gooder word for a safer, saner system that has learned from its mistakes." — Laurence J. Kotlikoff, Professor of Economics, Boston University, and author of Jimmy Stewart Is Dead.